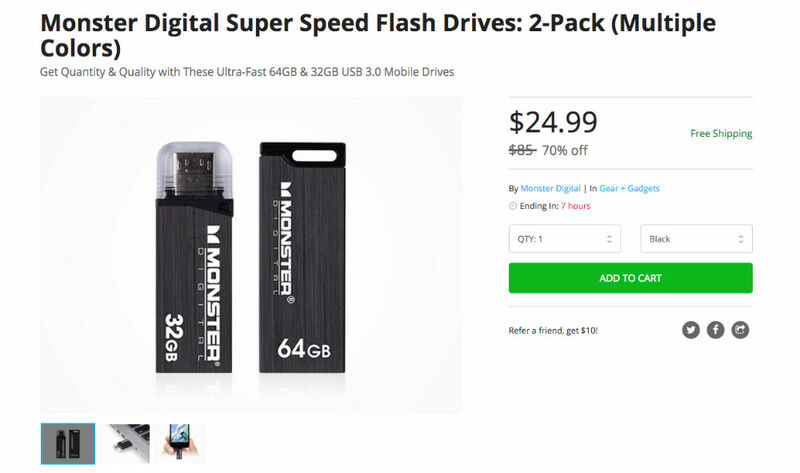 Through a deal taking place on the DL Deals Store, you can grab a 2-pack of Monster Digital Super Speed OTG 32GB and 64GB flash drives for just $25, down from their MSRP of $85. On Amazon, a similar pack is available for $27, but only offers two 32GB drives, no 64GB. Featuring a data transfer speed of 80MB a second, owners can utilize the OTG aspect of these drives, hooking them up to Android smartphones for insanely quick data transferring or for external drives. They feature metal exteriors, as well as protective caps so no pocket lint gets caught inside. Oh, did I mention you can buy them in either black or pink? Pink!